Many thanks to my friend Bob over at My Pen Needs Ink for letting me spend the day with this TeslaCoil pen from Michael's Fatboy. In case you're unfamiliar with Michael's Fatboy, the company is most famous for its large (hence the name) retractable ballpoint/gel pens, though they also sell rollerballs and fountain pens as well. Michael himself is based in Indiana, and is a fixture at some of the larger pen shows, including the Washington, D.C. Supershow and the Los Angeles Pen Show. The TeslaCoil series of pens is self-explanatory by virtue of its namesake: the defining features are the copper wire and stainless steel bolts lining the barrel, which is pretty chunky and definitely gives you something to hold onto when you're writing. That said, once you have it in hand, this pen is surprisingly comfortable to write with and is no novelty: it's meant to be used. The Fatboy features a spring-loaded clip that's bolted onto the pen - it's not going anywhere. That said, I mainly clipped this pen to a pocket inside my bag. It was too bulky to carry comfortably in a shirt pocket. This particular model has a red and black color scheme, which I love. The lower part of the barrel is lined with what appears to be vulcanized rubber, creating a nice surface to grip. With a metal pen of this size and weight, you need some sort of padding and/or texture, otherwise the pen would slide around and become difficult to manage during longer writing sessions. The pen accepts standard Parker-style ballpoint or gel refills. Here, I believe Bob swapped in a Schmidt EasyFlow 9000, which is my favorite Parker-style ballpoint/hybrid refill. The length and balance on this pen is perfect, but it's a little too "fat" for me to hold comfortably for long periods of time. To compare, the pen has a similar feel to fatter fountain pens like the Pelikan M1000, Montblanc 149, Delta Dolcevita Oversize, or even a Jinhao 159. 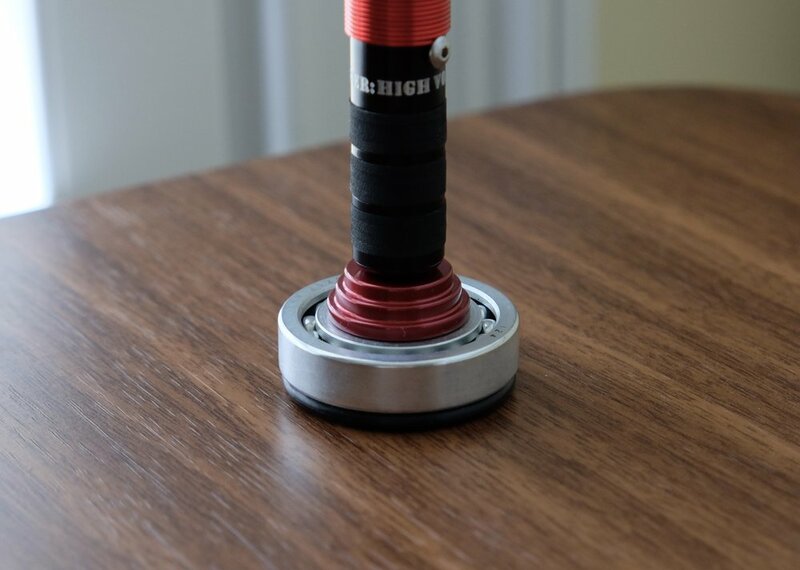 Sold separately: a machined metal pen stand with matching trim that rotates on ball bearings. The pen and the stand make for a very nice-looking desk set, and the stand is worth the small upcharge. Michael's Fatboy makes some unique pens that brings a different aesthetic to the market, and I'm glad that I was able to try this one out. Despite its size, the pen is generally comfortable to write with, and I can see how someone with larger hands than mine could use this as an everyday writer. Because I have only moderately-sized hands, at the next pen show (probably D.C.) I'm going to test out the "S-Model" series, which is a slimmer pen. Because of the attention to detail and obvious quality control that goes into manufacturing these pens, they command a premium price. Fountain Pen Hospital has the largest selection that I'm aware of, and the TeslaCoil pen featured in this review goes for $219, with the rotating pen stand available for an extra $45. The slimmer "S-Model" series that I discussed above is less expensive, starting at $85 and up, depending on the material/design you choose. Michael's Fatboy pens don't get reviewed that often, from what I can tell. Bob has a VERY comprehensive review available here, which I'd highly recommend, especially if you'd like to delve further into the specs and construction. He also looks at some different models, in addition to the TeslaCoil. Jeff Abbott has reviewed the slimmer S-Model over at the Pen Addict, which further reinforces my suspicion that it might be a better pen for me. Disclaimer: This pen was loaned to me by a friend, and was returned following completion of the review. This post contains affiliate links.